Oops - we don't appear to have a video for the ScanStation 700. Combine our bright, easy-to-navigate touchscreen, intuitive user controls, and administrator controlled functionality for a user experience that promises fewer mistakes and faster proficiency without the distraction of a separate PC. And Scan Station's quiet operation makes it office friendly. If you have many networked Scan Stations throughout your business, a system administrator can efficiently configure and maintain these devices on your network from one place. With increased ease of operation and improved file naming and security features, scanned content can be classified, organised, and searched by ad hoc users with minimal training while maintaining the degree of accessibility and security you’ve established. 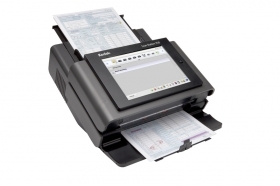 The Scan Station 700 turns documents into actionable information. It connects directly to your network to make capturing information to your business processes and applications fast and easy. You can also send digital files to multiple destinations. Only Kodak Alaris offers essential services to ensure the optimal operation of your scanning solution at time of installation and beyond. Kodak Scan Station 700 service plans, such as Startup Assistance and Network Scanner Training, put Kodak Alaris knowledge to work for you. Plus, access to our Help Desk and product experts, along with the latest product improvements, will allow the Kodak Scan Station 700 to satisfy your evolving business process needs for years to come.